When patients visit my dental office in Kettering, we make it a priority to go out of our way to make sure they feel like they’re part of our family. I truly enjoy helping patients achieve and maintain a healthy smile, while feeling comfortable and at ease. I’ve compiled a list of just a few of the many things that make being a dentist so incredibly rewarding. As your Kettering dentist, I care deeply about not only making sure you have healthy teeth, but also making sure you have healthy gums too. Why? Because studies are beginning to show possible links between gum disease and other illnesses such as heart disease and stroke. That’s why it’s so important to keep up with regular checkups and cleanings. It makes me happy to see patients free of problems such as cavities and gum disease! I also care about getting to know patients personally, to really understand them as a person. In order to make sure our patients feel like family every time they visit the office, I think it’s important to have a great relationship with my fellow team members too. 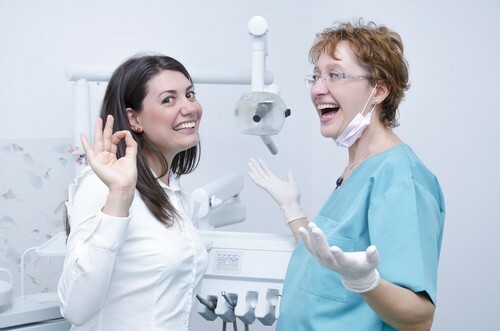 If we’re happy working together each day, it translates to our patients when they come to see us for appointments. When we’re happy about who we work with and the job we do, it makes everyone smile bigger and brighter. I never want a patient to feel uncomfortable or uneasy when they visit the office. My team and I never want having a dentist appointment to feel like a burden. It’s just another reason why we go out of our way to make sure you’re comfortable and feeling at ease every time you come to the office, no matter what the reason. It’s deeply rewarding to help a patient who was feeling nervous or apprehensive. We think it’s important to truly enjoy your dental visits… It’s beneficial to helping you restore your smile and your confidence. When you’re happy, so are we! We are always excited to have patients visit my Kettering dental office for so many reasons, beyond what we’ve shared with you here. Please never hesitate to call the office if you or someone in your family is need of a checkup or treatment. We’re always ready to help no matter what your dental care needs may be.